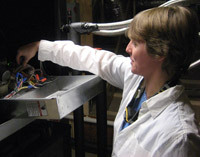 Cx Associates is actively involved in the measurement and verification (M&V) of energy efficiency measures for Efficiency Vermont, NYSERDA (the New York State Energy Research and Development Authority), Burlington Electric Department, Burlington International Airport and West Hill Energy and Computing. Our experience with measurement and verification is unique in Vermont, from large facility M+V requiring statistical sampling and sub-meter integration with existing building management systems, to gathering multifamily usage data and surveys. We've conducted over 70 M&V projects resulting in over 20 GWh and 5 MW of verified savings for commercial HVAC, industrial process, lighting, domestic hot water, and compressed air system measures. We utilize an impressive stock of instrumentation including 12 three-phase power meters, over 100 lighting, temperature, relative humidity, CO2, motor status, acceleration/tilt loggers and associated sensors, as well as calibrated instrumentation to verify DDC sensor readings in situ. Our proprietary data management tools, developed specifically for 8760 hour annual energy and demand analysis, enable accurate conclusions in short timeframes for modest budgets. Measurement and verification provides a critical feedback loop that allows building energy performance improvements to be identified, implemented and measured on an ongoing basis.